Aaron Ramsey's muscle injuries are not because of Arsenal's training methods, says boss Arsene Wenger. The midfielder, 24, suffered his third hamstring injury of the season in the 2-1 win over Leicester, but is expected to return in two weeks. Ex-Wales assistant coach Raymond Verheijen has blamed Arsenal's training methods for Ramsey's injuries. "We have individualised training," Wenger said. "I don't think that is any special case that has been neglected." 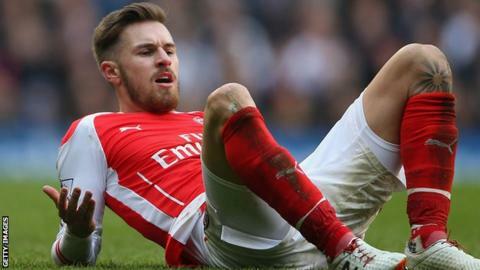 Ramsey's career has been blemished by injury and there were fears the latest setback would make him a doubt for Wales' Euro 2016 qualifier in Israel on 28 March. But Wenger says the Welsh midfielder should be back on the field again in two weeks, well before the qualifier. The Arsenal boss believes there is an underlying reason for Ramsey's problems, but the club have yet to find it. "It's not a major injury. It's a grade one," Wenger said. "There is an underlying reason that is medical or bio-mechanical, because he's a guy who is serious, works hard. "There's no obvious reason why he should have muscular injuries."